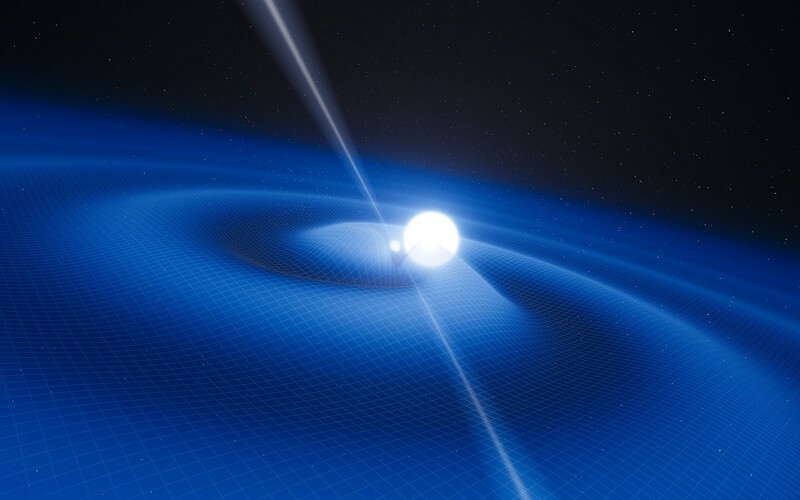 Recently popular-science websites have been buzzing with news of a new pulsar putting Einstein’s theory of gravity to its greatest test yet. In particular, some tout it as a test of alternatives to general relativity. While the attention this work has gotten in the press implies this is a new breakthrough, that’s not quite the case. So what’s the real deal on these latest findings? The results have been recently published in Science. In the paper the team presents observations of a binary system known as PSR J0348+0432. You can see this system in the lower right of the figure below, compared with PSR J0737-3039A/B, which consists of two pulsars, and PSR B1913+16, also known as Hulse-Taylor or H-T.
Orbits of various known binary pulsar systems. The Hulse-Taylor system is perhaps the most famous pulsar with a binary companion, since it provided the first observational evidence of gravitational waves. In Newtonian gravity, objects orbiting each other should continue to do so basically forever. This is because in Newton’s gravity stable binary orbits have no way to gain or lose energy. But Einstein’s theory of general relativity treats gravity as a curvature of space. This means that orbiting masses should create ripples in space known as gravitational waves (similar to the way stirring your coffee creates ripples). These gravitational waves carry energy, so over time orbits should lose energy by radiating gravitational waves. As a result, members of a binary system will move closer and closer to each other until they collide. 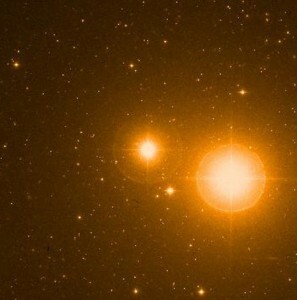 For most objects, such as binary star systems, this effect is far too small to matter. But if the members of a binary system are massive and close, then it can have a measurable effect. As you can see in the figure these binary systems are not that much bigger than the Sun, but the masses of these objects are as large or larger than the Sun. So they provide a good test of general relativity. The Hulse-Taylor system consists of two neutron stars, one of which is a pulsar. Since pulsars give off radio pulses at a very precise rate, we can measure the signal to know just how these two objects are orbiting. Hulse and Taylor observed this system over many years, and showed that they were slowly moving closer together just as predicted by general relativity and gravity waves. This won them the Nobel prize in physics in 1993. This new system (PSR J0348+0432) is hitting the press because it’s a little bit different. Most close binary systems like Hulse-Taylor consist of two neutron stars. Neutron stars typically have about the same mass (about 1 – 2 solar masses), so that means they tend to be rather symmetric. This new system consists of a pulsar (neutron star) of about 2 solar masses, and a white dwarf companion about a fifth the mass of our Sun. So this system is very non-symmetric. That means it might be able to distinguish between general relativity and alternative theories of gravity. 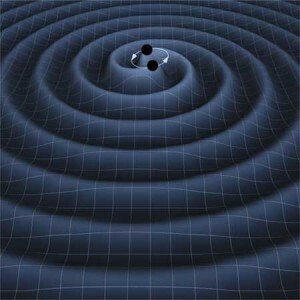 General relativity has passed every experimental test so far, but there are alternative theories such as scalar-tensor-vector gravity, or tensor-scalar-vector gravity (yes, they are two different models) that also make similar predictions for gravity waves. These alternative models are more complex than general relativity, and they are typically proposed as a modified gravity to explain things like the galaxy rotation curves that are commonly attributed to dark matter. They aren’t popular models among astronomers, but without a direct observation of dark matter, we can’t entirely rule them out. In addition to explaining away dark matter, these alternative gravitational models make different predictions about gravitational waves. This means the orbital decay predicted by general relativity and these alternative models differ in a measurable way. But to really see these differences we would want to observe a close binary system where the two members differ significantly in mass. Ideally they would also be in very elliptical orbits. This latest system has the non-symmetric aspect we want, but their orbits are very circular. This initial paper mainly just verifies the masses and orbits of this pulsar and its companion. It confirms that the two masses are very different, and it demonstrates that (so far) general relativity is still confirmed. That’s not really a big deal, so the attention it has gotten in the press is a bit overhyped. But the work also places some loose constraints on alternative models of gravity. It’s not nearly enough to verify or disprove them yet, but over the next decade or two it could provide a real test of these alternative models. That’s another reason for some of the hype. It is a way for the team to claim this particular pulsar system as theirs. So it is an interesting system, and it may provide an interesting test of gravity in the future. But it isn’t yet the “greatest test of general relativity” as many popular articles claim. 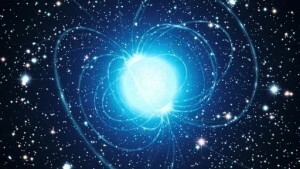 Magnetars, Pulsars, and X-rays, Oh My!